Salivary alpha-amylase (sAA) is a surrogate measure of the autonomic/sympathetic nervous system (ANS) component of the stress response (see Granger et al., 2007; Nater et al., 2009). What may be surprising to you is the rapid pace that salivary alpha-amylase publications have appeared throughout mainstream scientific literature. 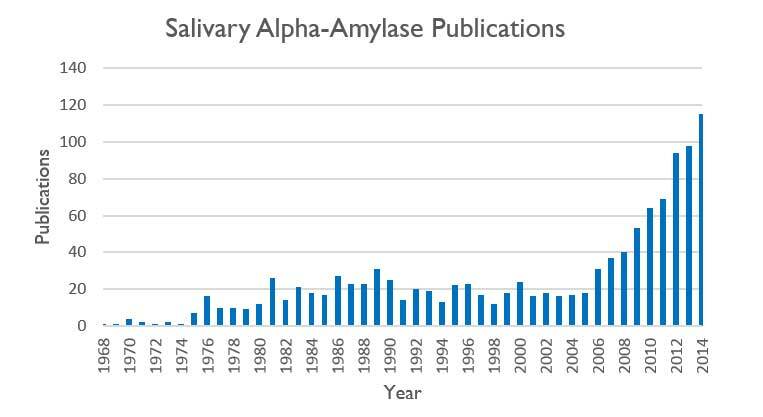 The number of salivary alpha-amylase-focused articles has increased 213% since 2005, and continues to increase year over year (see figure below). 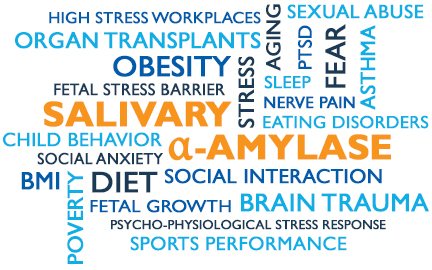 The integration of salivary alpha-amylase as a marker of stress has generated significant scientific critical mass with a sound basis and acceptance within the scientific community. Not only is the sheer quantity of published scientific investigations remarkable, but there is also a noticeable shift in fields in which salivary alpha-amylase is applicable. Continued research correlates salivary alpha-amylase to memory, cognition, behavior, food consumption/eating disorders, fetal development, psychopathic traits and aging. Even better, assessing salivary cortisol together with salivary alpha-amylase can operationalize individual differences in the HPA and ANS components of stress further clarifying the biological stress response (Gordis et al., 2006). Many of these discoveries have relied on Salimetrics’ quality reagents and tools. You might also not know that the majority of publications employing salivary alpha-amylase appear in journals of high impact. For example, a recent publication linked salivary alpha-amylase to telomere length in the prestigious journal Proceedings of the National Academy of Science implicating a direct mechanism of stress on cell aging and cancer (Zahran et al., 2015). Discoveries like this open a vast new area for exploration. Salivary biomarkers have gained wide popularity because saliva provides an easy, non-invasive and rapid sample collection alternative when compared to blood or urine collection and still produces valid, consistent and reliable measurements. We believe intellectual curiosity is critical to success. We invite you to imagine, dare, and exercise your intellectual curiosity at the frontier of salivary bioscience! As you grow the field of salivary bioscience, Salimetrics, will create the industry leading tools that advance the science based on top quality kits, services and cutting-edge knowledge. Granger, DA, et al. (2007). Salivary α-Amylase in Biobehavioral Research. . Annals of the New York Academy of Sciences, 1098:, 122–144. Gordis EB, Granger DA. (2006). Asymmetry between salivary cortisol and alpha-amylase reactivity to stress: relation to aggressive behavior in adolescents. Psychoneuroendocrinology, 31(8):, 976-87. Nater UM, Rohleder N. (2006). Salivary alpha-amylase as a non-invasive biomarker for the sympathetic nervous system: current state of research. Psychoneuroendocrinology, 34(4):, 486-96. Zahran S et al. (2015). Stress and telomere shortening among central Indian conservation refugees. Proc Natl Acad Sci, 112(9):, E928-36.